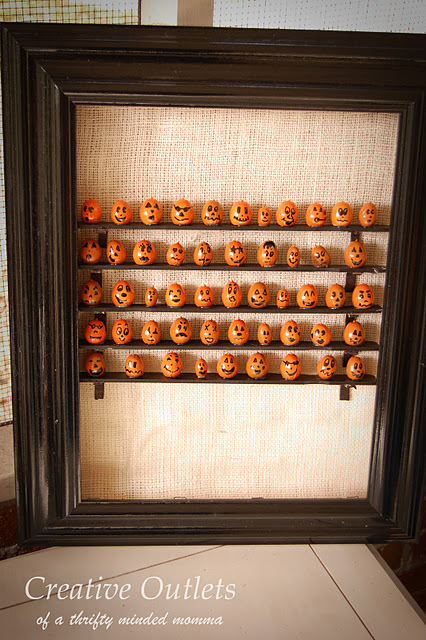 I shared the fun kid friendly acorn pumpkin craft a couple of weeks ago and just found this fun idea that takes those cute acorn jack-o-lanterns a step further. Katie created a bunch of them and made this acorn pumpkin lineup. They would also be really cute displayed in specimen art form. You can check out the acorn pumpkin line up tutorial over at Creative Outlets of a Thrifty Minded Woman. Ok, now this is adorable!!!! I can just picture you sitting watching TV and making a zillion pumpkin faces! Well done! I love little crafts like that... so cute!